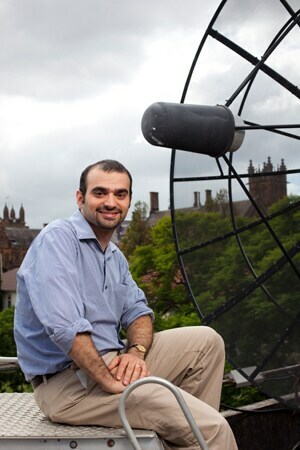 Professor Bryan Gaensler, from the School of Physics and Director of CAASTRO - the ARC Centre of Excellence for All-sky Astrophysics, has been elected as a Fellow of the Australian Academy of Science, announced on 27 March 2013. The Australian Academy of Science annually honours a small number of Australian scientists for their outstanding contributions to science by electing them as Fellows of the Academy. The Academy represents Australia's leading research scientists and is made up of around 450 Fellows, who are distinguished in the physical and biological sciences. Professor Bryan Gaensler, from the School of Physics and Director of CAASTRO - the ARC Centre of Excellence for All-sky Astrophysics, has been elected as a Fellow of the Australian Academy of Science. Professor Gaensler was made a Fellow in recognition of his fundamental contributions to our understanding of the universe through his outstanding research on high-energy astrophysics, cosmic magnetic fields and the structure of our galaxy. His pioneering studies have delivered a unique view on the brightest explosion in history, revealed the distribution of magnetic fields throughout the universe, and revised our estimates of the thickness of the Milky Way. "Being elected to the Australian Academy of Science is a very satisfying confirmation that I am a link in a chain of scientists - one that extends back into the past and forward into the future," said Professor Gaensler. "What I think the Academy recognises in having elected me is that I have worked very hard to be a strong link in this chain, and that I understand the importance of holding on very tightly to the links both before and after me. "There are two things about being a scientist that I value above all else. First, I get to work with many brilliant and inspiring people. I am lucky to have several excellent role models and mentors, to whom I am hugely grateful for their guidance and advice in all parts of my career so far. I hope that I continue to repay the faith they have put in me - I still have a lot to learn from them," explained Professor Gaensler. "The other thing I enjoy greatly is the chance to work with so many smart and motivated students and young researchers. The work that the Academy is recognising by making me a Fellow, has all been done in collaboration with my staff and students. I must give them a lot of credit for their clever insights and hard work." As part of his election as a Fellow, Professor Gaensler will present a summary of his work at the Australian Academy of Science's 'Science at the Shine Dome' event on 29 May in Canberra. "In this presentation, I will describe some of my team's recent achievements in our quest to map out the magnetism of the Universe." Professor Gaensler is one of 20 new Fellows elected to the Academy this year from across Australia, who have made exceptional contributions to knowledge in their fields. "Recognition from one's peers is always incredibly important. The Academy understands the challenges of science and research intimately, so their role in rewarding and promoting outstanding Australian science is a crucial part of our social fabric." Authorised by: Webmaster, School of Physics.